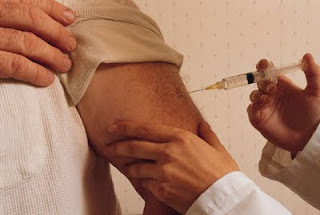 Despite objection in July from the New York State Nurses Association, New York has imposed a mandate for all health care workers to be vaccinated against the flu virus this year. New York was very hard hit last spring by the H1N1 Swine flu and is experiencing another rush of the illness so far this fall. According to a survey by the CDC (Centers for Disease Control and Prevention) less than 50% of health care workers take the annual flu shots. There are a variety of reasons cited, but many state that they "got the flu anyway" the last time they took the shot. The moral issues weigh in as well: what if you are sick and infect someone else? And what if they die from the flu after being infected by you? And what if too many nurses and doctors get sick all at once and there is not enough to care for the sick?